3.) We the Crown Trimaris strive to make known those whose courtesy, chivalry, and period presence make Our Dream a reality. We have found such a one in _____________, and in the year A.S. ______, on this ______ day of _______, We proclaim them Companion of the Order of the Argent Trefoil of Trimaris. 4.) The dream lives only in a world of chivalry and courtesy. Stand to the Thrones, ___________, exemplar to Us all, and be named Companion of the Argent Trefoil, Trimaris. As proclaimed by Our hand and seal, this _____ day of _____, Anno Societatis. 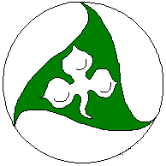 Argent, on triskele vert trefoil argent.